I've spent so much time peering into the passage of Patrick and Mary Barrett from Ireland to St. Louis -- 5 years on the sweeping tide of history -- that I forget they reigned for nearly 50 years on their farm in Franklin County, Missouri. They were homesteaders -- acquiring their first 80 acres through the Homestead Act of 1862. They worked hard enough to add another 240 acres by 1898  and to maintain a double-wide 2-story log cabin . When the Barretts decided to move from the city, they chose an Irish settlement known as Armagh, about 40 miles southeast of downtown St. Louis, along the Meramec River and just south of the Missouri River . Armagh took root in the 1830s as Irish settlers moving up from New Orleans were diverted from St Louis, up the Meramec River, due to cholera. Armagh expanded with the establishment of St. Patrick's "Old Rock" Church (1843) and the growing anti-Irish sentiment in the St. Louis. Work on the Pacific Railroad reached the area in the mid-1850s and brought more settlers. A family history reports that the Barretts moved to the Catawissa area about 1859  but other records show that their third child Bridget was born there is 1857. There is no record of them in the Calvey Township 1860 U.S. Census -- which could be for any number of reasons. During the Civil War, the area had mixed loyalties, but now claims to have been primarily pro-Union. There were some skirmishes with Rebels in the area, including a Confederate raid and ransacking by troops under General Sterling Price. There is no record of Patrick Barrett participating one way or the other. For more history of the area during the Civil War, see note . One benefit of the secession of the southern states was the passage of the Homestead Act of 1862, to encourage settlement (rather than slavery) in the states west of the Mississippi . As a result, farming along the Missouri River was completely reoriented. After the Civil War, the market for other products (corn, wheat, pork, etc.) exploded and took advantage of the nearby railroad to send them to markets in St. Louis and eastward. 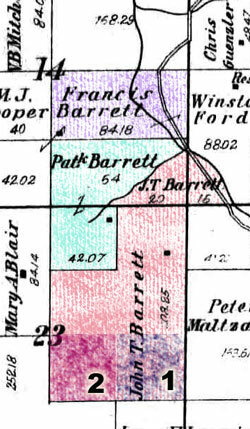 We don't know what the Barretts' land situation was before 1863. But sometime shortly thereafter, Patrick filed his first application for 40 acres (#1 on the map above). [See below for the process.] In 1870 -- after improvements were certified -- his first 40 acres was granted. In 1874 he acquired 42 acres more (#2 on map above). The Missouri Census of 1876  records that Patrick owned 4 horses, 3 mules, 12 head of cattle, 40 sheep and 24 hogs. His 25-year-old son John owned an additional horse and 34 hogs. Their farm produced 500 bushels of wheat, 300 bushels of corn, 12 pounds of wool and 3 tons of hay. It's sad to think that in that same prosperous year, they were mourning the death of their youngest daughter Jane, who died at age 14. By 1898, Patrick and his two sons had pushed northward toward the Missouri River to own about 324 acres. About 80 acres were still in the name of Francis "Frank" Barrett, even though he had moved his family to St. Louis (see below). The oldest, John T., lived with his parents (along with wife and 6 children) and made a career of farming, livestock and farm implement sales. He was also a member of the Ancient Order of United Workers lodge  and a Democrat. The second son, Frank (my great-grandfather), also started out as a farmer. With his Irish wife Ellen Gibbons they started a family while living with the Barretts. But Ellen balked at this situation. She hated the place and her mother-in-law because Mary made Ellen do chores "to save the men" and insisted she ride side-saddle to church every Sunday . Between their third and fourth child, in the late 1880s, Ellen and Frank moved back to St. Louis. Unfortunately, within 10 years, Frank was dead. While he was buried back in Catawissa, Ellen made it clear that she would never return there, dead or alive. She was buried in St. Louis. The end. Patrick and Mary died one right after the other in 1905 and 1906. About that time John and his family had had enough of farming. In his mid-fifties, he took his family to St. Louis, where he worked as a railroad watchman till the day he died (age 70). John was the only long-lived one among the sons and daughters of Mary and Patrick Barrett. His brother and three sisters all died in their forties. They were all gone by the time he moved to St. Louis. How the farm was sold is unknown. When from time to time it was decided to open to entry certain portions of the public domain, a land district was created, usually by an act of Congress, and all transactions connected with obtaining titles to land in that area had to be initiated and carried on though the district land office. Until the 1920's each land district ordinarily had two officials in charge, a Register and a Receiver, who jointly conducted the business of the office. The receiver was primarily responsible for the moneys taken in at the office; the register for the necessary record keeping. A person wishing to make an “entry” (i.e., to initiate proceedings that if successfully completed would result in the issuance to him of a patent to a tract of land) of any type went before the Register and indicated the tract of land to which he desired to obtain title together with the class of entry he desired to make. The entryman, the Register, and the Receiver then filled out and signed a series of documents. In the early period these ranged from the simple applications to purchase and receipts executed on the spot in connection with cash purchases. Later there was an elaborate series of applications, proofs, affidavits, public notices, and other types of documents executed over a period of years in later homestead and mineral entries. Persons making warrant or scrip entries were required to surrender the warrant or scrip they owned to the Register at the time of making entry. See detailed family facts, with dates and offspring here. Map: farmland owned by the Barrett family in 1898 in Calvey township, near Catawissa, MO. From Franklin County plat book, Township 42 North Range II E.
 The log house is still standing, still occupied. Ancient Order of United Workers. A fraternal benefit society founded in 1868, the first of its kind in the U.S. Its insurance program provided financial protection to its working class members. Based on the tenets of Freemasonry. The Homestead Act became law on Jan. 1, 1863. It allowed anyone to file for a quarter-section of free land (160 acres). The land was yours at the end of five years if you had built a house on it, dug a well, plowed 10 acres, fenced a specified amount, and actually lived there. Or, you could claim a quarter-section of land by "timber culture" (planting and successfully cultivating 10 acres of timber). Franklin County during the Civil War from the 1888 Goodspeed volume referenced in note .